USDJPY moved sideways in a trading range between 111.37 and 114.54 for several weeks. 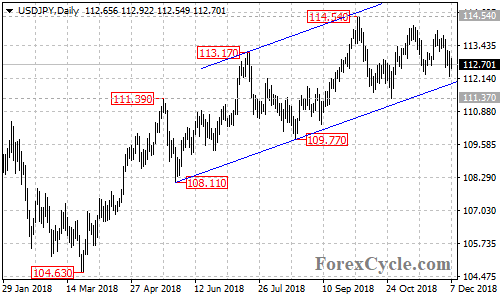 As long as the price is in the rising price channel on the daily chart, the sideways movement could be treated as consolidation for the uptrend from 104.63 and a further rise towards 115.50 resistance is still possible after the consolidation. Key support is at 111.37, only a breakdown below this level would indicate that the upside movement had completed at 114.54 already, then the pair would find the next support at around 109.50.